Exotic Caye Beach Resort may be best known for its amazing location, beautiful scenery and wonderful facilities, but they also work behind the scenes to help children attending local schools on the island. In collaboration with the non-profit organization CREED, which organizes a variety of programs to help support the many local schools on the island of Ambergris Caye. 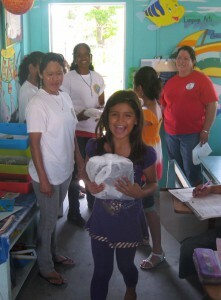 the Exotic Caye Beach Resort donated school supplies as well as cash in order to better assist the children of low-income families living on Ambergris Caye. In order for students to take notes, study for exams and create art projects in a school setting, they need several key items. Children of low-income families, however, are often forced to do without these items seen as luxuries in some communities. 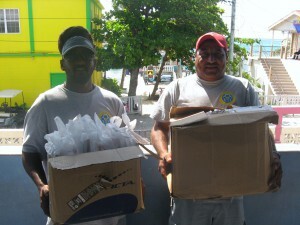 Exotic Caye Beach Resort made a significant contribution to the San Pedro Roman Catholic Primary School in the form of much-needed school supplies, and the students will undoubtedly greatly appreciate the donation. Items like pens, pencils, books, erasers, rulers, scissors and school bags can help students excel in academic settings. In addition to donating school supplies, the Exotic Caye Resort made a significant cash donation towards feeding children who attend the Holy Cross Anglican Church on Ambergris Caye. Support in the form of $500 BZ will go a long way in helping the school feed roughly 500 students each day. Another way that the Exotic Caye Beach Resort makes a positive difference in the community is through cash donations for larger items needed by schools. The resort was a leader in the whiteboard drive for the San Pedro Roman Catholic Primary School, and their cash donation was used to purchase a very necessary whiteboard for one of the classrooms. By leading the way in this effort, the Exotic Caye Beach Resort and ECI Development as a whole, works to encourage other island businesses to donate time and resources for these worthy causes on Ambergris Caye. Click here to learn more about the resort as well as additional ways they are raising awareness for other great causes by reading the "Community Involvement" category on the resort's blog. Copyright © 2015 Exotic Caye Beach Resort All rights reserved.